Escrow is not a word you hear every day, but now that you are involved in a real estate transaction of your own you owe it to yourself become educated on all facets of a service that you are paying for…..a service that can make or break one of the most important financial transactions of your life! Escrow can be complicated, but it doesn’t have to be. It is further made complicated by the fact that it has a number of possible meanings in a real estate situation. The very idea of escrow can seem daunting to those who don’t understand how it works, and how it benefits not only home buyers but also realtors and mortgage lenders. So, what is escrow? And more importantly, how can your escrow experience with Sterling West Escrow can benefit you? Think of escrow as your middleman or the neutral zone between two parties during real estate transactions. An escrow company can hold deeds, bonds, money, or even a piece of property on behalf of the original owner and then release it once all obligations have been met by both parties. By hiring an escrow company, the buyer is required to put up the funds or whatever is being offered from his/her end, but the seller does not receive that money or property until the agreed-upon conditions have been met. In practice, escrow services aim to protect the interests of all parties involved in a particular real estate transaction. From the buyer's side, having an escrow account guarantees that you will actually get what you pay for and to ensure that the terms and conditions of the transaction are adhered to. Escrow agents are tasked with holding all critical documents and deposits and guiding the involved parties through working out details. An escrow agent is a neutral third-party who can facilitate communication and finalize even the most difficult transactions. Escrow agents are also trained to manage the paperwork required to make the transaction legitimate and final. Following the closing of a real estate deal, an escrow officer will oversee that all documents required to close a transaction are provided for proper recordation. When all the terms and conditions have been met, the escrow agent will disburse the funds to the seller and the property deed or asset title to the buyer. To make the transaction official, the escrow agent will also record the paperwork with the county and state so that the new property ownership is recognized by governing bodies. Both parties will also get their copy of an estimated final closing statement. Once received, make sure to check the contents of the statement for its accuracy. If any errors are identified, contact the closing agent immediately. If no errors are found, safely store the statement along with other vital paperwork. Knowing an experienced Real Estate agent and Escrow Officer are essential to the process of a fluid execution of your transaction. Next time you wonder, “What is escrow?” Sterling West Escrow is here with the answers you need. Whether you are a first time home buyer, or know from experience how helpful it is to have an experienced and knowledgeable escrow agent overseeing your sale, refinance or purchase, we can answer all your escrow questions. It’s what we do! 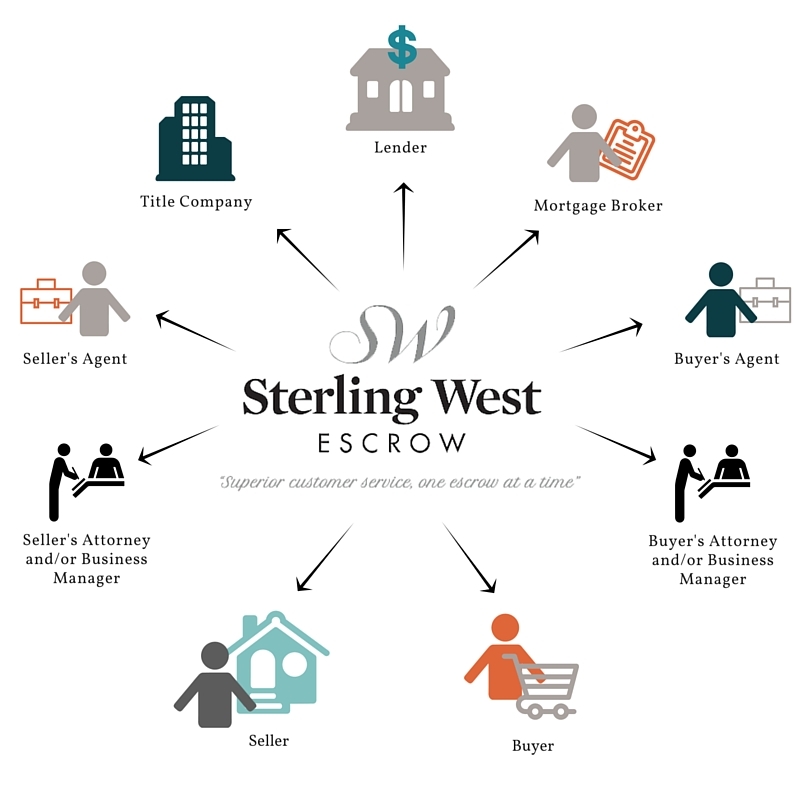 Sterling West Escrow has a multi-pronged approach that balances the potentially conflicting needs and interests of consumers, investors, and financial companies. We are up to the task of achieving this balance. Our main objective is to give you clear, straightforward guidance and exceptional customer service, delivered with integrity, respect, and the highest level of ethical conduct. Contact us today to find out how our concierge escrow service can benefit you.